In the new story over at Foot’s Forecast out of State College, Pennsylvania they warn that ‘something wicked this way comes’ to parts of the mid-Atlantic through New England as a late winter blizzard takes aim at nearly 50 million people. Expected to strike all of the major population hubs along the East coast from Washington DC to Baltimore to Philadelphia and up to New York city and Boston, a winter that has brought little to no snow to our nation’s capitol in Washington DC is expected to pack a wallop there over the next several days, beginning late Monday night. As Wikipedia reports, the ‘Northeast megalopolis’ was home to more than 49 million people back in the year 2000 and is expected to grow to more than 58 million by 2025. With 17% of the US population on less than 2% of the nation’s land area, the Northeast megalopolis preparing to be pummeled by Winter Storm Stella is the very definition of high population density with 931.3 people per square mile compared to a national average of 80.5 per square mile. As the map seen above shows us, the Washington DC – Baltimore region is quite literally ‘in the bullseye’, expected to receive at least 2.0″ total liquid projection – an amount that could bring 12 to 18″ or more to much of the Maryland suburbs and even more up into New York and New England. Knowing that an inch of snow often brings the DC area to a standstill, what might up to or more than 18″ do? Expect that the stores there will be cleaned out by Monday afternoon. Expected to bring along with it blizzard force winds, this massive storm is just the latest bizarre weather hitting much of the US this Winter with some of the same areas basking in temperatures of nearly 70 degrees only a week ago. And as we learn below, every day we’re getting more and more indications that ‘weather modification’ or ‘weather warfare’ may be playing a major roll in the bizarre weather that we have been getting across America lately. 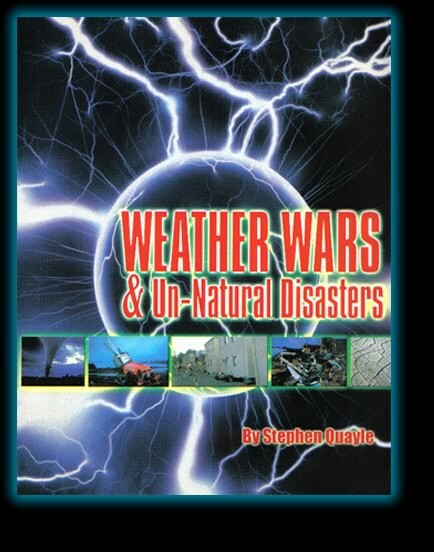 Are large parts of America including Washington DC and the East coast now under a weather warfare attack? And might China somehow be involved? This September of 2016 story from Pravda is called “China Ready To Launch Weather Warfare?” within which they report China was only a stones throw away. 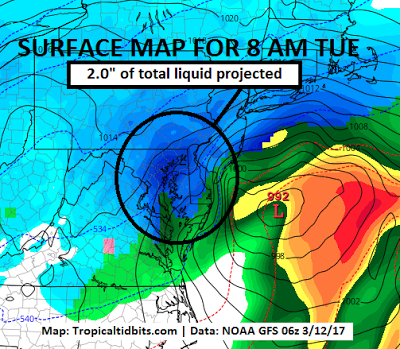 As we see by looking over at the Tropical Tidbits GFS numerical model prediction website, the massive storm coming this week may be followed by another snowstorm to the mid-Atlantic and parts of New England by next weekend. For snow lovers upset that the snow never arrived this year, the month of March may bring their panacea. 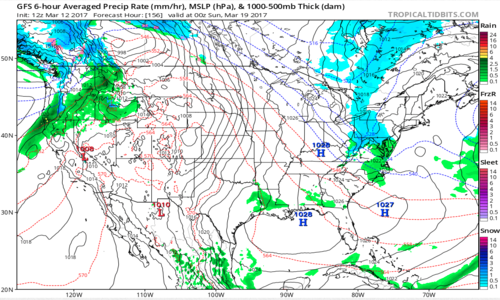 You can see next weekend’s forecast for Sunday March 19th in the screenshot from Tropical Tidbits above. We’ve previously reported several times about the bizarre weather all across America during the winter of 2016/2017 while sharing the evidence with you that we may be witnessing full-scale weather modification or ‘weather warfare’, and while the mainstream media as a whole will call weather modification ‘fake news’, every day we get more proof that people across the world are awakening to what Steve Quayle warned us of years ago. Drones are used for aerial photography, surveillance, news coverage, and rescue operations. Now a group of scientists and researchers are figuring out if drones can make it rain. The science is called cloud seeding, and it is being tested in Nevada at an FAA site, four hours north of Las Vegas. Seeding clouds involves releasing flares of silver iodide from a plane’s wing to generate more ice particles in a cloud. This aims to help a cloud’s ability to produce and enhance precipitation. The weather conditions need to be right for this to take place–cloud cover and even the presence of storms are optimal. The process has been around for decades and usually involves a piloted aircraft flying into a storm. Now, The Nevada Institute of Autonomous Systems in conjunction with the Desert Research Institute has conducted tests with unmanned drones. They hope to have drones conduct cloud seeding flights in the future. The Governor of Nevada’s office has helped fund the project. In this new story from The Daily Journal of Fergus Falls, Minnesota the author courageously asks if propaganda is behind the mainstream media. Our author asks us to read the Fargo Forum for the first week of December 2016 and a story that reports upon a pilot who recently died and his plane owned by a company called “Weather Modification Inc.” “Who is paying, who authorized and what purpose or results are companies like this having on climate change? Why is the mainstream media not questioning? Maybe propaganda?” our author asks, questions we’ll never see the MSM address. And great questions according to this recent story from The Pacific Standard which asks “Geoengineering: A Dangerous Tool or Climate Control of the Future?” Reporting that earlier in the month of February, the nation of Jordan ORDERED MORE RAINFALL via cloud seeding technology, they also report that California recently ‘ordered more snow’ as well to help their ski season. And what recently happened to California? Earlier this month, Jordan, the second most water-poor country in the world, ordered more rainfall through cloud-seeding to help alleviate water shortages. Jordan’s cloud-seeding experiment followed after Russia, which last year ordered the rain to fall earlier in order to guarantee a dry day for parades and celebrations. Around the same time as Russia was manipulating its weather, California’s Tahoe Basin, desperate for extra snow for the coming ski season, ordered, well, more snow. In the first video below, Dane Wigington from the Geoengineering Watch gives us his latest geoengineering global alert in his March 11th of 2017 update. Warning us of the dangers of secrecy in a free and open society, why has the mainstream media failed us so by calling weather modification ‘conspiracy theory’ for so many decades? In the 2nd video below we get a time lapse video of the bread in a New Jersey supermarket being wiped out in these hours before the storm hits. And with Stella preparing to slam the East coast, putting 50 million in the line of fire, in the final video below we hear Pastor Paul Begley breaking down for us this beast now bearing down upon the East coast. For those who still don’t believe in weather modification, even after all of the proof we’ve been getting lately, please check out this website which will happily sell you weather modification equipment from China.